A contemporary art installation by Paola Pivi at Palazzo Strozzi is bringing wonder and shock to Florence again. 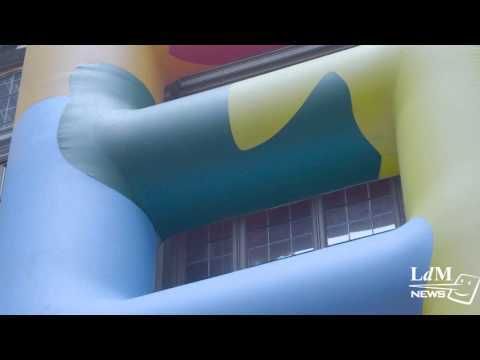 Recently installed in the courtyard of Palazzo Strozzi, an inflatable “ladder” rises twenty meters high from the ground to the top floor. The colorful, non functional, and huge ladder highlights the contrast between classic, Renaissance art and the contemporary art. Born in Milan, Paola Pivi is a leading Italian artist who explores the border of reality and fantasy, by altering parts of images and placing ordinary images out of context. Upside-down airplanes, zebras in Alps, and colorful animals acting like human.., her works let people to see the unreal, different world. In the same way, the ladder by Paola Pivi at Palazzo Strozzi quite “out of it”. We are not allowed to climb up this ladder – actually, this ladder is too huge to climb up. Taken the use away, this ladder has lost its context. Instead, it has got kaleidoscopic colors dancing on the smooth, shiny rubber surface, which is very unreal and unusual for a ladder. This artwork that intentionally “does not make any sense” is the opposite of renaissance style that was all about “making sense”, which includes Palazzo Strozzi. Yet, this ladder let the viewers’ gaze climb up to the top of palace, and eventually to the open sky. The installation ends on 28th of February, 2016. Entrance is free.